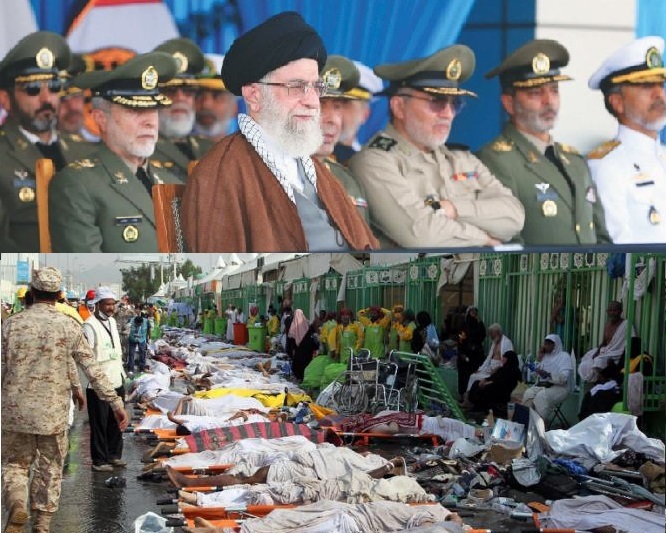 JNN 01 Oct 2015 TEHRAN: Iranian-Saudi tensions intensified on Wednesday as Tehran threatened a `fierce` response over delays in repatriating Haj stampede victims and the Saudi-led coalition said it had seized an Iranian boat carrying arms for Yemeni rebels. At least 239 Iranians died in last week`s tragedy near the holy city of Mecca and another 241 are listed as missing. Iran`s foreign ministry spokeswoman said that among the missing was Ghazanfar Roknabadi, 49, the country`s former ambassador to Lebanon, a highly sensitive post. The two rivals in the oil-rich Gulf were already at odds over Iran`s support for Huthi rebels in Yemen, which lies on Saudi Arabia`s southern flank. That prompted Riyadh to form a coalition of Arab nations to combat the Huthis. `Saudi of ficials are failing to do their duties, Iran`s supreme leader Ayatollah Ali Khamenei said in a speech to graduating navy of officers, following delays in the return of the Hajis dead bodies, accusing some of the officials of `slyness` `They should know that the slightest disrespect towards tens of thousands of Iranian pilgrims in Mecca and Medina and not fulfilling their obligation to transfer holy bodies will have Iran`s tough and fierce reaction.` His comments underscored Iran`s increased frustration at Saudi Arabia`s refusal to allow a cargo plane into the kingdom to retrieve the dead and take them back to Tehran. Last week, Tehran also claimed Riyadh had failed to issue visas for Iranian officials who sought to travel to Saudi Arabia to facilitate the repatriation of the dead and the injured. `The Islamic Republic of Iran has so far showed self-restraint and abided by Islamic politeness and brotherhood,` Khamenei added, urging the formation of a fact-finding committee by Islamic countries to investigate the causes of the stampede.Six days after the tragedy, many bodies have yet to be identified, and Iran fears that many of its people still unaccounted for may be among them. Khamenei`s remarks came hours after Iran summoned the Saudi ambassador for the fourth time since the stampede to demand the swift identification and repatriation of bodies. Riyadh has accused Tehran of playing politics with tragedy. Meanwhile, the coalition said it had seized a boat last Saturday in the Arabian Sea, 150 nautical miles off the Omani port of Salalah, loaded with weapons destined for Yemeni rebels. It said the boat, registered to an Iranian as a fishing vessel, was carrying 18 Concourse anti armour shells, 54 BGM17 anti-tank shells, 15 shell battery kits, four firing guidance systems and various items of launch-related equipment. Saudi Arabia and its allies have repeatedly accused Iran of arming the Huthi rebels who have seized Major Parts of Yemen, including the capital. But despite a six-month air and sea blockade, they had not previously come up with any evidence. In May, an Iranian boat headed to the rebel controlled Red Sea port of Hodeida with 2,500 tonnes of aid was diverted to Djibouti following warnings from the coalition and the United States. This entry was posted in Iran News, Middle East and tagged Ali Khamenei, Haj Pilgrims, Hajj Stampede, iran, Irani supreme Leader, Saudi Arabia. Bookmark the permalink.